Many of us are launching full speed ahead with Christmas now that November is coming to a close. While writing your Christmas cards, don't forget to send something extra special to your child or even an adult buddy. You know, something special like a video message from Santa and his elves! Portable North Pole makes Christmas magic with its beautiful personalized videos that will make anyone at any age feel special. Use the special discount code to save on your videos! Thank you to US Family Guide and Portable North Pole for the complimentary passes for this review. All opinions are my own. I've been using Portable North Pole for a couple years now and it has become one of our Christmas traditions to make these video messages for our kids to get them excited for the Christmas season. Additionally, when you make a Christmas video, you can have one made and sent to your child on his birthday, too. It's a joy to watch their faces and reactions to the videos as they watch Santa and the elves talk to them. The videos are personalized, making the kids feel extra special since Santa knows about specific things going on in their lives, which you tell Santa about, of course! You can even request for Santa to ask the children to do something like keep their rooms tidy like we did in my daughter's video or keep up with their homework or listen to your parents like we asked our son to do in his video. Our kids loved their videos and it really put them in the Christmas spirit. They adore watching the elves run around and gather the things that Santa asks for like finding the children's personal books and files. This year, we were thrilled to be able to use the Pre-Season Magic Pass, which allowed us to make longer videos and included more options on what type of video to create for each child. This works much better since we have two kids who watch each others videos, which can make them a little suspicious when the videos look the same. We didn't have that problem this year when we chose two different types of videos that we had access to with the Pre-Season Magic Pass. The free videos are awesome, too, but this way, each child had his own unique video that made both of them feel special instead of the same one using different names. 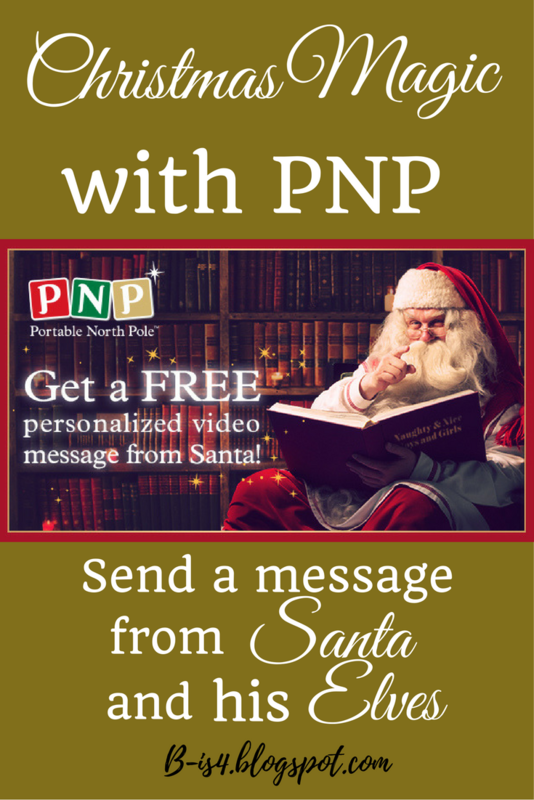 Santa Video Messages for Adults, Too! These video messages are fun and special to receive even if your child no longer believes in Santa or if you have an adult you'd like to send a video message to like your wife, husband, best friend, or brother. Yes, you heard that right, Portable North Pole allows you to create a video for adults, as well! I sent one to my hubby through email as a little surprise. You can customize the photos and messages in each video. One of my favorite parts about these videos that are helpful is that you can make sure the recipient's name is pronounced correctly by Santa. After you enter the person's name you're sending it to, there is an area that allows you to choose the correct pronunciation, so be sure to choose the right one! You can even make a phone message to send your child. See more details about Portable North Pole in this previous post and the various types of packages they offer. Are you ready to save on your videos and make this Christmas magical for a special little one?